You are here: Home > News > BREAKING: Foyle Civic Trust & Walled City Partnership WIN Overall UK Heritage Angel Award UK! 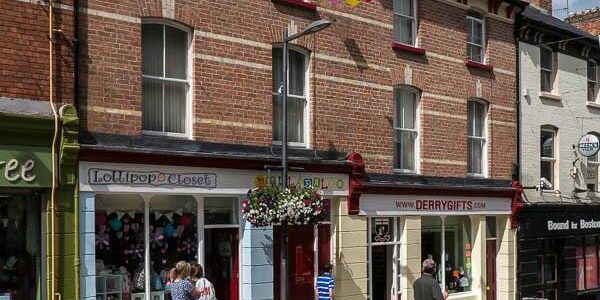 Foyle Civic Trust, part of the Walled City Partnership, Derry has been crowned overall UK winner in the 2018 Heritage Angel Awards for their work restoring and regenerating the historic city centre in a scheme known as the Townscape Heritage Initiative (THI) the main funder being the Heritage Lottery Fund. This has attracted more than £10 million over recent years and resulted in more than thirty buildings being restored to become attractive useful assets once again breathing vitality and optimism back into the city centre. Members of the Trust were presented with the Award by Lord Andrew Lloyd Webber at the Award ceremony last night in the Gillian Lynne Theatre, London. The project was chosen from twenty finalists from England, Scotland, Wales and Northern Ireland after previously winning the Best Major Regeneration of a Historic Building or Place for projects in excess of £2million category in the local stage. The Heritage Angel Awards have taken place in Northern Ireland since 2017. They celebrate the efforts of local people, either individuals or groups, who have rescued, researched or recorded historic buildings and places. The awards are administered by Ulster Architectural Heritage (UAH) and the main funder is The Andrew Lloyd Webber Foundation. UAH organise a consortium of heritage organisations who contribute significantly to the Awards through a steering and judging group. These organisations include: Heritage Lottery Fund NI, Department for Communities , Historic Environment Division, Construction Industry Training Board NI, Institute for Historic Building Conservation, Heritage Trust Network and the Centre for Archaeological Fieldwork. In 2018, the awards have also been supported by Department for Communities and Derry City & Strabane District Council. In 2010, the Foundation embarked on an active grant giving programme and has now awarded grants of over £19.5m to support high quality training and personal development as well as other projects that make a real difference to enrich the quality of life both for individuals and within local communities. Townscape Heritage Initiative, or (THI) is the title of an HLF funding Initiative, with projects delivered by people, and communities for townscape heritage regeneration, in towns and cities across the UK. In this case, the Walled City THI scheme was created from the recognition that a legacy from the recent troubles was the destruction of historic buildings around Derry’s walls and the perception that repairs were a short term measure with owners aware of the possibility of further damage. It was against this backdrop that the THI scheme emerged, recognising that Derry’s built fabric was an asset to the city. The purpose of the Townscape Heritage Initiative was to enhance the visual appearance of the environment as well to improving the physical, economic and social conditions of the Conservation Area in which the scheme operates. The objective being that the areas may succeed as retail, cultural and residential areas, with an emphasis on vibrant mixed use economy, providing a safe and attractive environment in which to work and live while injecting a pride of place and supporting independent shops and small businesses with unique identities and styles. To date THI have facilitated the repair and restoration of over thirty historic properties with the aid of grants from the Heritage Lottery Fund and other key funding bodies.